Any OS is bound to get slower due to the pile up temporary and unnecessary files which are not easy to clean in a 1 click process.MacCleaner is a free Mac OSX Disk Cleanup Utility that scans your Mac, find insecure and unnecessary files and delete them, protecting your privacy, reclaiming disk space and speeding up your computer.In simple words MacCleaner is what CCleaner is for Windows. Temporary files from instant messengers, file sharing, e-mail clients, FTP clients, RSS clients, and VoIP clients. MacCleaner requires Mac OS X version 10.4 “Tiger” or Mac OS X version 10.5 “Leopard”. Note : Files once deleted by MacCleaner cannot be restored. You need to register at MacCleaner Forum to receive an activation key, which you need to enter when you first use the application to use all the features of MacCleaner. This is Vanessa from EASEUS software company. 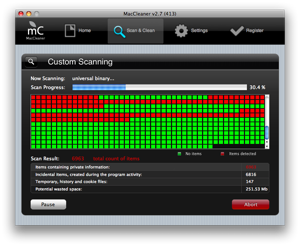 I found your review: MacCleaner – Mac OSX Disk Cleanup Utility, which is great. I’m writing this to request you if you’d like to add our latest product – MacCleaning to your review. MacCleaning is a free handy all-in-one menu bar utility to fast clean Mac junk files, show disk space available, warn when the disk space is running low, and eject drives, etc.